We at The Latina Book Club are intrigued by all things Mayan and Egyptian so we are happy to welcome an author who has combined both cultures in an exciting, dark and chilling series. Welcome Raquel Zepeda Fitzgerald, a CEO turned writer, and author of The Osiris Trilogy Mystery Series. And many thanks for her gift -- a free guidebook to the series; see below. Meanwhile, here is the scoop on her trilogy and what she plans for Halloween! Let’s start with a peek at the book trailer for Book Three in the series, OSIRIS 333. Click here. Q: Tell us about your fascination with the Mayan and Egyptian cultures? What inspired your series? How do you conduct your research? RAQUEL: As a child I was very interested in the Aztecs because my paternal grandmother was part Aztec. Then I saw that movie, The Mummy. The part that scared me the most was when they wrapped up the priest alive. It gave me nightmares. The first time I went to California, my cousins took me to the Egyptian Museum in San Jose. When I started writing THE EYE OF OSIRIS, I spent a lot of time researching occult studies like astrology and numerology. A lot of the ancient religions were based on astrology. As you know, the Egyptians, Aztecs, and Maya were great astronomers and based a lot of their beliefs on some form of astrology. My interest in the Maya is more recent. They actually have a closer likeness to Egyptology in my opinion. My fascination with these cultures is their use of symbology and rituals. I guess being born Catholic, you learn to embrace rituals and some symbology. Not to mention the belief in some force that can help you like magic. We all could use a little bit of magic. Like most people, I do my research online. Thank goodness for the internet! Q: Please give us a summary of the books in the Osiris Trilogy Mystery Series. RAQUEL: Book One: THE EYE OF OSIRIS. Moriah Maizon, the main character, is a legal assistant working for an attorney who gets involved with the Rosicrucian Order. The Rosicrucian Order, who is deeply involved in Egyptology, spawned another group that called themselves The Eye of Osiris. When Moriah’s boss, Jim Patton, is murdered, she is arrested and accused of his murder. Lt. Mendoza, the detective assigned to the case eventually realizes that Moriah is innocent. An unlikely relationship develops between them especially when they learn of their common interests in Mexican culture. Although Moriah was born in California, her roots go back to Mexico when many Mexican-born French were being persecuted. When the bodies started piling up, Lt. Mendoza and all San Francisco hope it’s the work of a serial killer because the thought of a supernatural force committing executions is too unsettling. Finally, Lt. Mendoza states the question that plagues everyone's mind, "Is this the work of a supernatural power or super intelligent madman?" 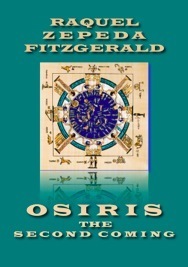 Book Two: OSIRIS- THE SECOND COMING. 16 years after The Eye of Osiris murders, Moriah has a premonition through a dream about their return. While Luis Mendoza tries to assuage her fears, the cult is once again preying on the city of San Francisco. By then, Moriah has developed supernatural powers. Desperately searching for answers, Moriah asks for Gordy’s help (Mendoza’s grandfather in law). She knows his underground library holds secrets only known to the ancients. Suddenly Moriah is transported to an undersea world now inhabited by people once known as pharaohs. Moriah and her BFF Veronica race against time to get back from a mysterious underwater vortex. Ready to battle against the entities raging war against her and her family, Moriah must now unleash her great powers. Book Three: OSIRIS 333. Moriah and her clan find themselves in Mexico regrouping. There, they find a very unusual connection between the Egyptians and the Maya – a combined knowledge of alchemy. Until then, it had remained secret. Simultaneously, a Mayan book is unearthed containing hieroglyphics in both Maya and Egyptian, along with Greek text. Coined as the Rosetta Stone of Mesoamerica, the world at large awaits in awe. Knowledge is power. As the underground Temple of Osiris rumbles, the citizens of San Francisco are once again stunned. But it had to be done and Moriah was the only one up for the task. Q: What can we learn from these ancient societies? RAQUEL: We can learn that war can destroy a society in its entirety. There are many theories, but the one that rings true is war. With regard to the Aztecs, can you imagine losing your children to sacrifice? I believe the Aztec citizens were open to the Spaniards because they initially thought they would have a safer life with them. Q: Is the Mayan calendar dead or has it been reset? RAQUEL: Very funny! One thing I thought was fascinating about the way they count time was their reliance on the planet Venus. One of my hobbies is astrology. Here’s a good source: http://www.ancient-world-mysteries.com/mayan-calendar.html I don’t believe the Maya expected the world to end in 2012. There are still people who use that calendar in parts of Central America. Q: I read somewhere that a new pyramid was found off the coast of Brazil that is older than the ones in Egypt. Is this true? Which and where is the oldest pyramid? RAQUEL: Pyramids seem to popping up everywhere. This year, archaeologists discovered an Egyptian-style pyramid in Kazakhstan, a country located in Asia. Some claim it was built 1,000 years earlier than some Egyptian pyramids. The pyramids in Brazil appear to be more like mounds that were built by some Native Americans all over the U.S. Couldn’t find any good intel on this subject. Some claim they were built in 3000 BC which would still not outdate the Pyramid of Djoser. In Monte d’Accoddi, Italy, there is a mound or step pyramid believed to have been built between 4000–3650 BC. Around 2667–2648 BC the Pyramid of Djoser in Egypt was built, still believed to be the oldest pyramid. Q: Have to ask -- do you have a favorite pyramid and have you visited it? Do you have a favorite Mummy movie? RAQUEL: Sadly, I have never been to any pyramid. I do hope to visit the pyramids here in Mexico soon. My favorite is still “The Mummy” which was released in 1932. Q: What are you working on now that your Osiris Trilogy Mystery Series is over? RAQUEL: I have written other books and short stories while working on the Osiris Trilogy. For example, my short story “Buyer’s Remorse:” SNAPPED! Cindy didn't know what to do about Mark's dead, poisoned, and stabbed, bloody body. A $100,000 reward for Mark was announced that same evening on a crime TV show. Mark was wanted for fraud and murder. Cindy's best friends called to warn her. Now, they had to act fast! As they learned more, Mark had planned the perfect murder. Cindy had felt an intuition that Mark was about to end her life. It was a case of intuitional homicide! Would the cops buy it? Watch the trailer by clicking here. There is also my Bone Collection Trilogy. Book One, UNFINISHED BUSINESS, was inspired by true events! It’s a tale of unadulterated greed, identity theft, piracy, betrayal, revenge, and getting the last laugh. Book Two, BODY CRAFT, delves into Hollywood’s secret love affair with beauty and the occult; leading to the craftiest avenues for weight-loss. And Book Three, BONE GARDEN, reveals the thoughts of someone obsessed with their oral proclivities, secret desires, and “six-feet deep” secrets. My next project is DEAD BOSS CEMETERY DOT COM! I’ve already written a few pages. This one should be lots of fun! Q: What writers do you read -- Latino and non-Latino? RAQUEL: I am very sensitive to racist issues regarding Hispanics/Latinos. Because of my physical appearance, I have had to listen to people’s tirades about how they hate us. And, of course, I have had a lot of arguments with sooo many people about it. My father has a very dark complexion and I know the crap he used to deal with. Anyway, when it comes to literature that entails stories about surviving racism, I cannot read them. I am way too emotional about it. Patterson, Steve Martini, Reed Arvin, Jonathan Kellerman, Lisa Scottoline, Greg Iles, Sandra Brown, John Dunning, Heather Graham. Jane Hitchcock, Linda Howard, John Lescroart and Barbara Parker. Q: What are you plans for Halloween? RAQUEL: I’m not really sure since I just moved to Cabo San Lucas. I hope to find a nice party to attend. If not, I can always dress up, watch a spooky movie and drink a bottle of wine! Q: How can fans reach you? 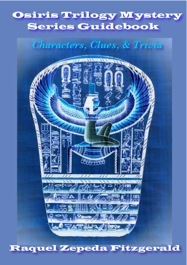 Get the free guidebook to The Osiris Trilogy Mystery Series by clicking here. 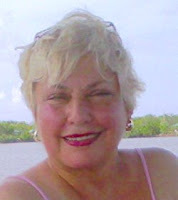 ABOUT THE AUTHOR: Raquel Zepeda Fitzgerald has authored several books. In 2005, she published her first edition of THE EYE OF OSIRIS. In 2010, she published a second edition. MY BONE COLLECTION, a collection of three short stories was published in 2011. A second edition of the My Bone Collection stories has been released as three separate books. In early 2013, “Buyer’s Remorse,” a short story about getting away with murder was released. 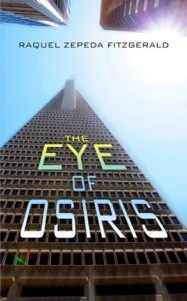 During the autumn of 2013, Raquel published a sequel to The Eye of Osiris, Osiris - the Second Coming. 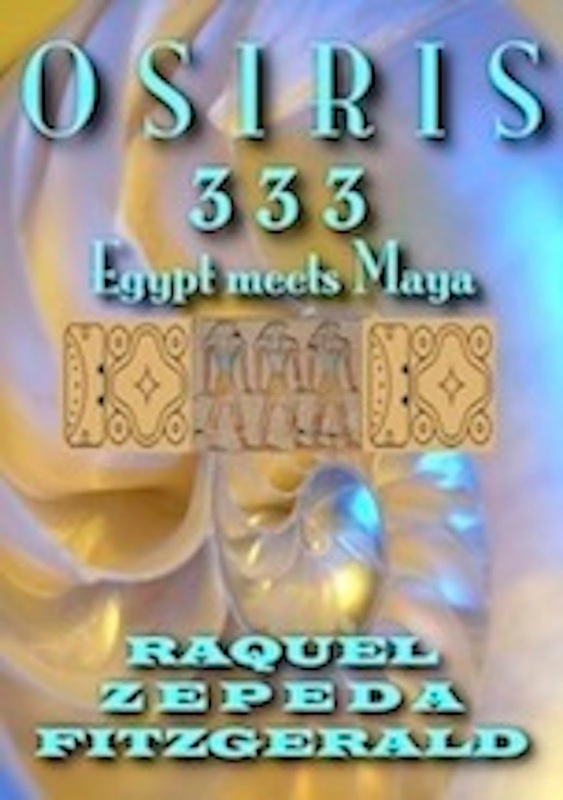 She has just published Osiris 333, which completes the Osiris Trilogy Mystery Series. A guidebook for this series is available. Up next is Dead Boss Cemetery Dot Com! In addition to books, Raquel has also published a collection of greeting cards known as Think Blots, Shrink Blotz, and Luv Blots. Having held the position of CEO for many years, Raquel has also had a career in business and legal administration. She currently works as a paralegal in the corporate securities industry. Visit her at www.raquelzepedafitzgerald.com.